I avoid discussing local politics in general because I have always felt that my agreement or disagreement with the establishment had little to no impact on policy decisions. Today, I’m approaching a topic that is emotional in nature. In the past few days. we’ve been inundated by news reports and opinion pieces from all sorts of people. Many have been loving and heavily positive about Mr. Lee’s life, some have been overtly negative. But one stands out to me, that of Mr Low Thia Kiang’s parlimentary tribute to Mr. Lee. The post-speech reactions have been strong, with detractors saying that he has sullied the great legacy of Mr. Lee. Firstly, both TODAY and The Straits Times misrepresented Low’s speech, making it sound like he was attacking Mr. Lee’s legacy. 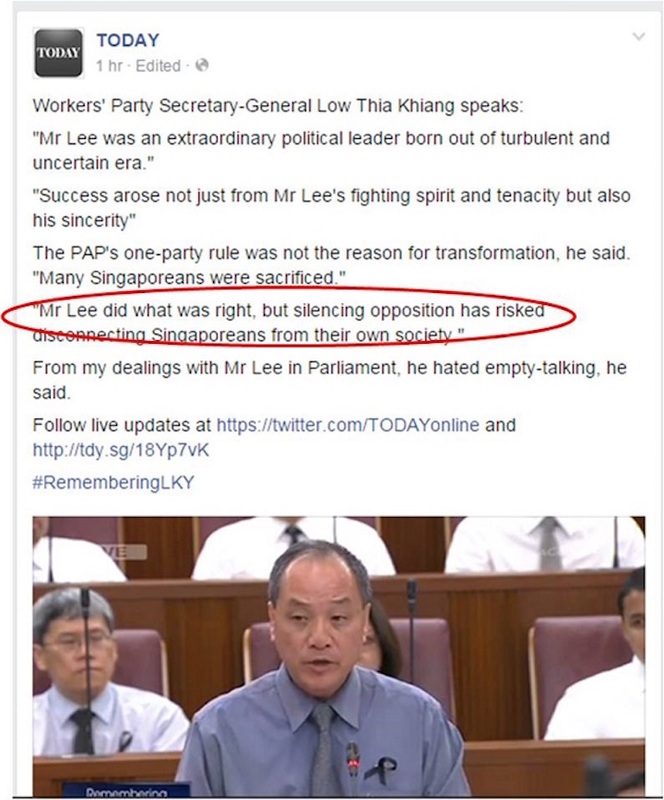 Low never said that Mr. Lee “silenced the opposition”. Of course, the knee-jerk detractors went into overdrive and starting launching attacks. So why have so many people lashed out at such a balanced and respectful tribute? I personally think that it’s Singapore going through an accelerated Social Puberty. One set into overdrive by the death of Mr. Lee. As a society, we’ve given very little thought to the concept of losing such a titan. Add this to the fact that we have been in an era where our society is struggling to make sense of a newfound openness and you can see why many of us are still looking at things in a little bit of a black and white perspective. Today, reasonable criticism could be levelled at the ruling party with little or no persecution (Roy Ngerng went overboard, obviously), and maybe even get a positive change from the establishment. Today, we can sit on Facebook in our comfy offices and talk about this issue. Today, we have the freedom, time and luxury to BLOG about this. I’m thankful to Mr. Lee for that opportunity, and the many other things I have in life that would just not be possible. This is why he deserves the best, most balanced tribute from Mr. Low.